Everybody knows that keeping your body healthy and clean is very important for living a long and happy life. If you only take care of the physical appearance of your body but ignore and neglect the inside, it will eventually catch up with you. The same can be said for your car and truck. Sure, a great paint job, nice rims, and a dent-free body look great, but what good is a car that doesn’t run? Maintaining your engine regularly is good way to keep your vehicle running smooth and increasing its lifespan. Unfortunately, you can’t just use a bucket of warm soapy water to wash your engine the way you do the body. There are a lot of electrical connections and parts that are integrated into your vehicle’s engine, and even a little moisture can have a damaging affect. Using water to detail your engine can also cause rust to form and can lead to corrosion. Plus water may not be able to get rid of some of those built-up grease stains. However, there are a wide variety of different engine cleaner that can help get it sparkling in no time. Cleaning your engine can make your car look newer, run better, and even prolong the motor’s lifespan. However, there are many different types of products and choosing the right one depends on what type of cleaning you plan doing. Do you plan on just getting st the outer block of your motor, or do you really want to get in there and clean it inside out? We’ve reviewed a number of different products in an effort to find one that best suits your needs! The list below features various types of cleaning solutions and the benefits they each have. Does it seem like your vehicle is not running as smoothly as it used to? One of the problems can be that the motor may need to be cleaned. A good engine flush before your next oil change will not only enhance the combustions process, but it can also restore your engine back to full performance, making it feel like new again. Liquid Moly’s professional grade detergent can clean the inside of your motor and get rid of the deposits, lacquer and sludge that are causing it to underperform. There are some parts of the motor that we just cannot reach, and it’s usually these parts that start to rust and corrode due to lack of maintenance. 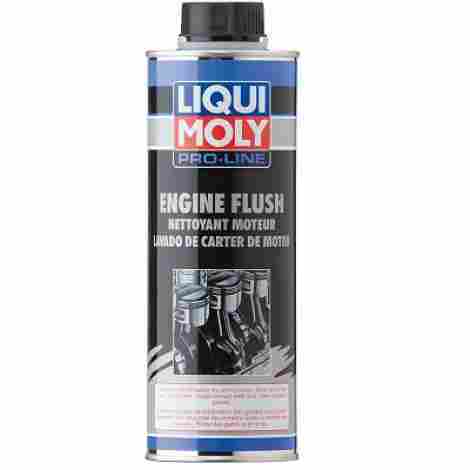 The ingredients in Liqui Molly’s engine flush not only protect these metal surfaces from corrosion, but they also restore its oil lubricating properties. It doesn’t matter if you have a diesel motor or a gasoline motor vehicle, this highly effective detergent works just as great on both. You simply add it to the oil before you change it out and let your vehicle run on idle for about ten minutes. When you drain the oil out, all of the sludge will come with it. Keeping your vehicle well maintained will always save you money in the long run. Liqui Molly engine flush is a professional grade detergent that cleans fast without doing any damage to seals and other motor parts. Looking for an all-purpose option that can replace all the different detergents you have collected over time in the garage? This product is a citrus based detergent that is designed to take on the toughest jobs while still being safe enough to use on leather and fabric. It comes in a concentrated formula that can be diluted to serve your cleaning purposes and can make up to 12 gallons of detergent. Using harsh chemicals is not only dangerous and toxic to the user, but it can also damage your vehicles motor after long term use. Chemical Guys developed an all-natural recipe that uses citrus extract to clean grime, dirt and stains from all surfaces. This all-purpose product takes advantage of advanced foaming technology to give you a deep clean that most other cleaners can’t achieve. Foam is able to get into crevices and crack more efficiently and pull out grime and dirt effortlessly. Why buy a collection of detergents if there is an all-in-one option that can be used for everything? Save money and space with a cleaner that will your vehicle sparkling inside and out. 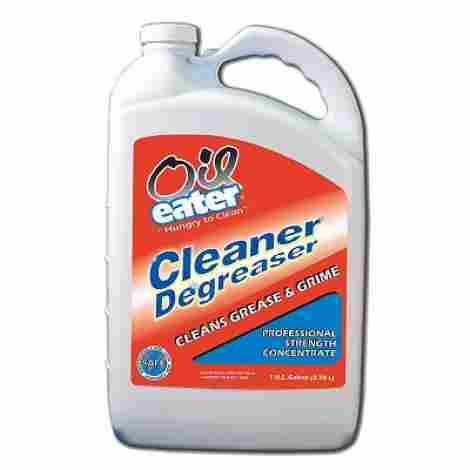 Oil Eater’s degreaser provides you with a quick a safe way to quickly dissolve oils and grease from almost any surface. It comes in a one gallon container that contains an undiluted degreaser and a dilution chart to help you find the right strength for the job at hand. This is gentle enough to use on carpets, laundry and bathtubs, but also strong enough for industrial use such as motors, machinery, and concrete floors. Whenever you bring a chemical into the house, it is important that it is safe to use. This is non-corrosive, non-toxic, and non-hazardous degreaser that was approved by the USDA to be used on non-food surfaces. Although it has the power to dissolve oils and grease, this water-based, biodegradable cleaner features no petroleum solvents, acids or abrasives, making it safe enough to even use in septic tanks. For an extremely low price, you get one gallon of concentrated degreaser that can be used in the home and in industrial settings. It has a dilution chart on the container to ensure that you mix the right amount and has been approved by the USDA. For those really tough jobs, choose the degreaser that professionals use for cleaning aircraft engines, removing water lines from boats, and even taking black streaks off of RV’s and airplane bellies. It’s very easy to use; you simply spray on the area that needs to be cleaned, use a towel or brush to scrub the area, and then wipe it off before it dries. Some of the most difficult stains to remove are those black streaks that form on older oxidized paint and gel-coat. This biodegradable solution also works great on tires, wheels, and all types of engines. If you’ve ever looked at your motor and thought that there was no way anything can get it clean, think again. 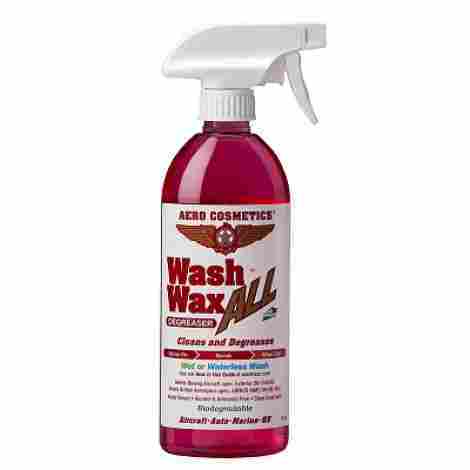 Aero Cosmetics’ Wash Wax Degreaser is so strong that it even meets specifications set by Airbus and Boeing Aircraft. This very powerful product was designed to take on some of the toughest jobs, including removing aircraft turbine soot. It has no alcohol or ammonia and works on all surfaces, including aluminum, rubber, leather, and wood. This must-have top product will help you get the highest performance from your vehicle possible. For the best results, it’s recommended that you use it every five thousand miles to remove carbon buildup which, if left untreated, can cause pings, hesitation, rough idle and flat spots. It is also great for protecting, fog, and storing 2 and 4 cycle gasoline engines. Keeping your engine clean and well-maintained is vital for making sure that your vehicle passes the emissions test. Sea Foam SS14 is registered with the EPA and designed to clean combustion chambers and intake valves, helping you receive a pass. Whether you’re a professional auto mechanic or car collector, there may come a time when you need to store an engine for certain amount of time. This product can be used on all types of fuel-injection and carburetor motors for storing and protecting. This product is great for cleaning a number of different motor parts, including throttle bodies, combustion chambers, upper cylinders, brushings and more. It’s even safe for oxygen sensors and coated parts. This product comes from one of the top brands in the industry. Producing some of the strongest and toughest degreasers available for more than 55 years, they more than know what it takes to get rid of the muck and grime that has been building up on your vehicle’s motor. All you have to do is spray on, let the foam do the work, and fifteen minutes later, spray the foam off. Although we all want our car’s engine to look clean and shiny, not everyone is as enthusiastic about the scrubbing that it involves. Gunk Foamy Cleaner uses a special foam technology that can even cling to vertical surfaces to safely clean with no scrubbing necessary. Unlike many other products, this was specifically designed for use on motors with covers. It’s also safe for your vehicle’s painted and rubber parts, so there is no need to worry when spraying it on your engine. As one of the best-selling cleaners on the market, you can on its effectiveness. You can also use this on RV’s, power motors, motorcycles, tractors, and just about any other engine that needs a good cleaning. 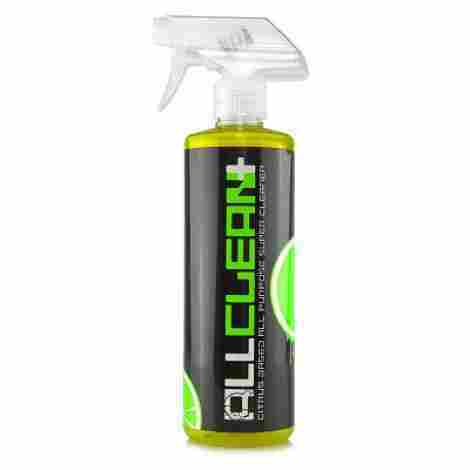 This environmentally-friendly, mild product is the perfect cleaner for car collectors and enthusiasts alike. It is the ideal choice if you like keeping your vehicle clean and maintained at all times. Griot’s Garage created a specially formulated degreaser that will quickly and easily break up and loosen up grime, grease, and motor gunk. If you have a classic car that you like to bring to shows, then this is a must-have accessory. With so many toxins and chemicals polluting our environment, it’s important that we use products that don’t contribute to this problem. Griot’s Garage created a formula that is strong enough to cut through grease and oil without harming the environment. A quick, superficial clean job is ok if you just want your engine to look good. But if you are serious about the upkeep and maintenance of your vehicle, then you’ll need to make sure that you get to those hard to reach areas as well. The spray stream feature on the bottle will make sure that you have no problem doing just that. 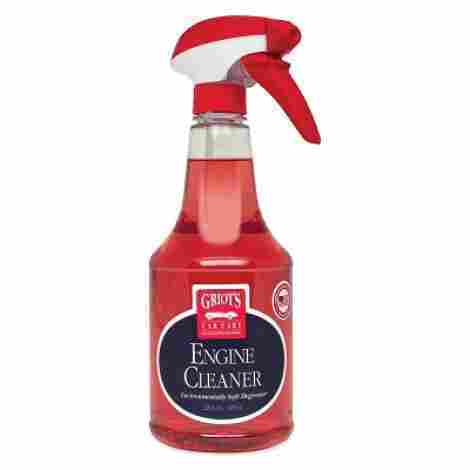 Griot’s Garage product is great for touch-ups and getting rid of dirt and grime stuck in hard to reach places and is also safe for your vehicle’s paint. It comes at a low price and the bottle last a long time. 3D Professional Detailing Products have been creating high-quality detailing products that are known and used all around the world. 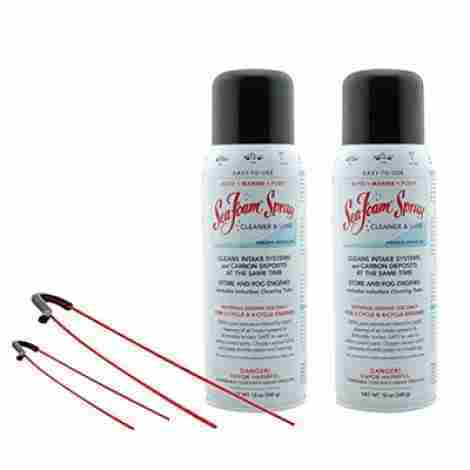 Car collectors depend on this product to bring an old classic motor back to life and shining like new again. It’s an amazing product to have in the garage as you can also use it for cleaning tools, machinery, and floors. It rinses of easily and doesn’t do any damage to painted surfaces. It comes as a concentrated formula in a one gallon container that can be diluted at 1:4 parts water for heavy-duty jobs, 1:10 for medium duty, and 1:20 for light duty. The degreaser is also safe to use on rubber, metal, and plastic surfaces. Safety of your health and environment is a priority for 3D Professional Detailing Products. That is why thy created this engine degreaser to be biodegradable and VOC compliant, which means that it meets government regulations on volatile organic compounds. This highly concentrated degreaser can make up to 30 gallons for cleaner that can acts fast to loosen grime and grease. 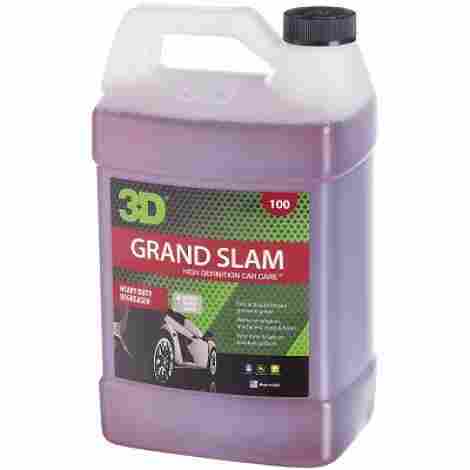 Can be used for a variety of different cleaning projects and is ideal for keeping motor looking immaculate. 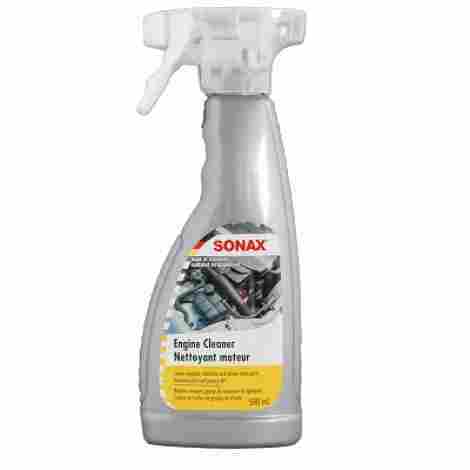 As an engine cleaner, you’ll find that Sonax makes a pretty reliable degreaser formula. It’s effective at reaching most inaccessible areas and removing greasy dirt and oil. You can safely use this product on all of the motor’s metal components, hoses and tubes and doesn’t contain any acid, phosphate, or solvent. This is a handy product to have in our garage and is very inexpensive. It’s not only important to clean your engine, but you want to make sure that the detergent you are using is not doing harm to your engine as well. The formula used for this product is not only strong, but also safe on all metal engine components. 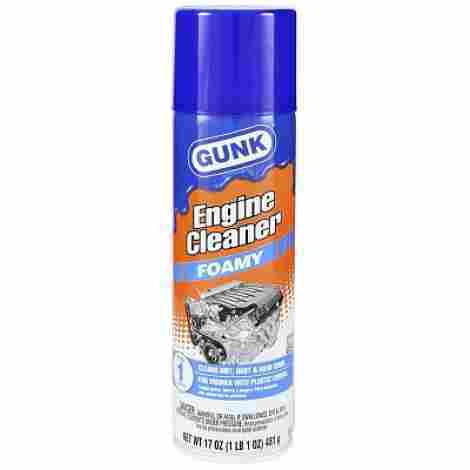 Gunk can build up in places we can’t even see, causing a drop in your vehicle’s performance. Sonax Cold Cleaner is able to get into those places and break down the dirt and grease so it can be sprayed out. Sonax is a highly respected company that has been making automotive cleaning products since 1950. They have won numerous awards and you can definitely see why with this highly-effective detergent. Did you just buy a used vehicle and are skeptical about the service history of the engine? For a super concentrated, professional-grade crankcase cleaner you can count on Throttle Muscle Engine Scrub to get that motor clean and running at top capacity again. 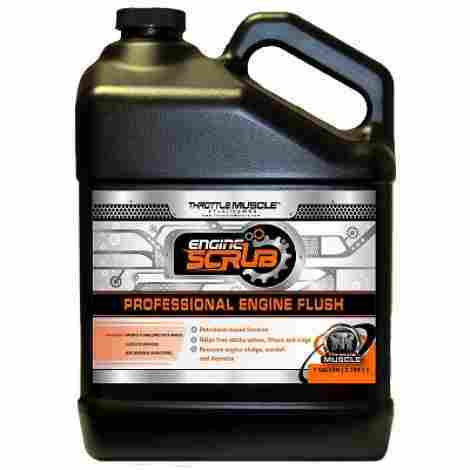 Unlike other engine flushes that are primarily solvent, this product has a unique residue solubilizer and a top notch engine oil base to protect your motor as well. Whether you’re preparing for a motor oil change because it’s been a while since your last drain or you just bought a used vehicle, it’s important that you do a flush to get all the built-up grease and sludge out. Throttle Muscle’s concentrated formula will remove all that and more. Having a smooth running motor is important for longevity and performance. This unique formula is petroleum based and not only cleans, but it also helps free lifters and sticky valves for higher efficiency. Although this is one of the more expensive detergents on the list, you get a full gallon of highly concentrated cleaner that can take on heavy-duty jobs. Performing an engine flush every five thousand miles can really increase your motors lifespan. As you can see from our list, there are many different products for your engine. Some of these degreasers clean the inside, others for the outside, and some that are designed specifically for touch-ups. All if these solutions are easy to use and trusted by professionals all around the world. Whatever brand you decide suits your needs best, always keep in mind how important it is to maintain your vehicle’s engine. It not only looks good, but it helps performance and endurance. Although they all have the same purpose, to clean your motor, they are not all made the same and can also differ in function. To make sure that you choose the right type, you have to first know what type you need. Metal Solvent – This type of detergent is specially designed to clean the metal parts of your vehicle’s engine. It is very effective at removing grease, dirt, and oil and can also be used in automated cleaning equipment. Petroleum-Based – This is ideal for removing residue that has built up from oil, gas, and lubricants. It has some drawbacks however it contains ethanol and distillates and can be toxic to inhale. Foam – These types of degreasers are great for low to medium-duty jobs that don’t require scrubbing. Foam can cling to vertical surfaces to cut into dirt, grease, and oil in hard to reach places. Vapor Solvent Cleanses – For heavy-duty jobs you should use vapor solvents, which is heated up in a specially designed machine to produce vapor that can penetrate thick build-ups of motor gunk. Environmentally-Friendly – We should always try to buy products that are safe for the environment and lately, many manufacturers are doing their part in creating cleaning formulas with environmentally-safe ingredients. They’ve found that items like lemon juice, baking soda, and vinegar have strong grease cutting and cleaning power. Knowing the concentration level of the engine cleaner you plan on purchasing is important in ensuring that it is strong enough to handle your task. Most brands will let you know on the product label whether it’s a mild degreaser or a heavy-duty, professional grade detergent. There are also concentrated options that can be diluted with water and even comes with a dilution chart. There’s no need to use harsh products when you only need a little touch-up. Consumers have become more environmentally conscious with their purchases and manufacturers have taken notice. In order to keep up with the increasing trend and do their part in preserving nature, they have created formulas that are increasingly using natural ingredients. They have found that items like baking soda, lemon juice, and vinegar are strong degreasers. Everyone wants a nice and shiny motor, but not everyone is as motivated to put in the physical effort needed to achieve this. There are some products that claim to work without the need to scrub the grime away. Some foam style options do a good job and have the ability to cling onto vertical surfaces. Before you rush and but the first foam product you see, make sure you read reviews on the item. It’s always a good idea to see what experience other people had with that particular item. There are more than just metal parts under your hood, and if you plan on using some kind of cleaner, you make sure that it won’t cause any damage. Always read the product’s label to see if it is safe to come in contact with the plastic and rubber parts that are connected to the motor. You’ll want to see if it damages paint so you can take extra precautions if needed. Some degreasers can even be used to maintain other surfaces, including leather, plastic, wood, and vinyl. Q: Why should I wash my engine? Cleaning your engine regularly has some benefits that can save you a lot of money in the long run. A shiny motor is not only aesthetically pleasing to the eye, but it can make an old car look newer and well-maintained. This is great for anyone who plans on selling their vehicle as it can increase the value. Any car enthusiast or collector will tell you that a clean engine is just as important, if not more important, than a well-detailed body. Cleaning your vehicle’s engine will get rid of the gunk that has accumulated over time from dirt, grease, and oil. This allows the motor to run smoother and cooler, giving it a longer lifespan. A clean block can also help you identify small problems like leaks, which can turn into a big problem if not identified and repaired fast enough. Keep in mind that grease and oil can also increase and speed up the wear plastic parts and rubber hoses. Q: I’m preparing to sell my car, how do I properly clean my engine so I can get a higher asking price? Cleaning your engine is not that difficult, but you do have to follow certain steps to make sure you don’t do any unintentional damage. Find a well-ventilated area where you can freely spray your vehicle down without worrying about getting something wet. You’re going to want to protect all the electrical components by covering them all up before you start. Liquid or moisture can cause damage to electrical connections, alarm systems, spark plugs, distributor and battery wirings among other things, It’s important that all these parts of sufficiently wrapped to stop water from getting in. Make sure that the engine is not hot. Thoroughly spray degreaser all over the engine bay and make sure that you get in all the corners and crevices. You’ll want to leave the degreaser on for a few minutes so it can absorb into the oil and grease and break it up. Use a brush to gently scrub the parts of the engine where gunk has really built up. Use a pressure washer to rinse away the degreaser and grime, but don’t put the pressure too high to avoid spraying water on electrical components. Use a microfiber towel to wipe the area as dry as possible. You may have to go over some dirty spots with a little more degreaser and some elbow grease. Q: Can I just use soap and water to detail my engine bay? It’s never recommended to use soap and water water in your engine bay. The problem with regular soap is that it’s not powerful enough to cut through the grease and oil that has built up over time. And if you use too much water, you risk the chance of getting it in electrical components or inside the engine where it can cause problems. Using water also increases the chance of rust forming. Q: How can I tell if my engine needs cleaning? One of the easiest and most obvious ways is to take a look at it. Is it dirty? Is there any gunk, grease, or oil building up on any areas of your engine bay? Other symptoms that point to a dirty motor include a smoking exhaust, increased fuel usage, slow pickup, a drop in performance, the check engine light turns on, and failing the emissions test. Q: Will the degreaser damage chromed items? You should always read the product label carefully before buying. There are some that are mild enough to use on all surfaces, including leather, carpet, and plastic. Then there are more concentrated options that are specifically designed to be used on certain metals only. Q: How often should I clean my car’s engine? That depends on the environment you normally drive in. If most of your driving is in urban and suburban areas, then you probably don’t need to detail it more than once or twice a year. If you drive in harsher conditions, dirt roads, or heavy snow and rain, then you should probably detail it every two or three months, especially during the winter months. Q: Can I use my power washer to clean the engine bay? Your vehicle’s engine has a lot of parts that are not meant to be exposed to water, so anytime you plan on washing it, you take the chance of doing some damage. That being said, using a pressure washer only increases the chance of water entering where it’s not supposed to be, even if you wrap and cover the sensitive parts. Q: What do I need to cover before washing my engine bay? To ensure that you safely cleanse your motor without causing any damage, you need to make sure certain parts are properly covered with plastic bags or foil to keep water and moisture out. Since not all vehicles are the same, it’s best that you the owner’s manual first to find out the best way to clean the engine bay. Here is a few parts that always need to be protected: distributor, electronic components, air intake system, carburetor, sensors, and spark plug openings. Q: Will degreaser cause damage to my vehicle’s paint? That depends on the product. There are some detergents that are safe for many surfaces, including panted surfaces. There are also many detergents that strip the clear coat of paint from your vehicle. It’s always best to read the product’s label and reviews from others who have use the product in the past. Q: Can I use engine degreaser to get rid of the grease and oil on my hands? Although many companies are now using more natural ingredients in their products, many of the heavy-duty products can irritate the skin and possibly even cause burns. There are degreaser soaps that are specially made for using on your skin safely that are just as strong. Cars – Are There Any Mechanical Benefits to Cleaning an Engine?